Starting March 1, Flint high school seniors can begin applying for the Flint Promise scholarship—which pays up to 100 percent of college tuition, books and fees. This is the first year for the new Flint Promise Scholarships, which is open to Flint students who graduate from one of 11 Flint high school or GED programs in 2018 or later. Students who live in Flint and attend high school in Flint for four years can have 100 percent of those costs paid for with help from the Flint Promise Scholarship. Prorated scholarships also are available for those who lived in Flint for at least one year but less than four years. This “last dollar” scholarship covers costs after grants and other scholarships are applied. The scholarships allow Flint students to earn a certificate or associate’s degree from Mott Community College. It can be used for up to three academic years. After students complete their associate’s degree or transfer certificate, they are guaranteed admittance into the University of Michigan-Flint, and the Flint Promise Scholarship can be extended up to three additional academic years to allow students to earn their bachelor’s degrees. The application deadline this year is July 16, 2018, for students who plan to start college in fall 2018. Students can apply for the Flint Promise Scholarship up to age 24. 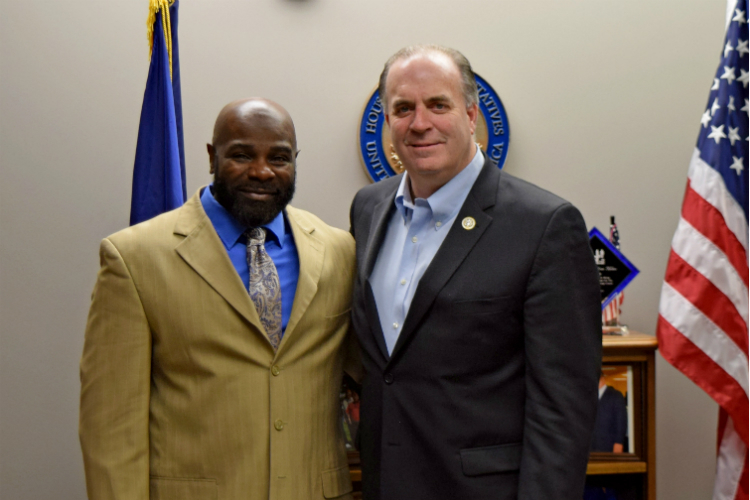 Pastor Jeffery Hawkins of Flint attended the State of the Union as the guest of U.S. Rep. Dan Kildee Tuesday. Hawkins, of Prince of Peace Baptist Church, lost both of his sons to gun violence and actively works in the community to end gun violence. Hawkins works with the Ceasefire Initiative, CAUTION, and in community meetings. Three community leaders will be honored during the Genesee District Library 17th Annual Black History Month Brunch, which will feature Linkin’ Bridge, an a cappella group that was a top 10 finalist on “America's Got Talent” in 2016. Pastor Jeffery Hawkins, Charles “Chuckii” Montgomery Jr., and Sam Wells will be honored for the contributions to the community during the event 10 a.m. Saturday, Feb. 3, 2018, at Genesys Conference and Banquet Center. Communities First Inc. also will be honored as the partner in progress. Matt Franklin, news anchor for ABC Channel 12, will emcee the event. Tickets are available online or can be purchased at the Genesee District Library headquarters, 4195 W. Pasadena Ave. in Flint. Tickets cost $35 each. Proceeds from the event benefit Genesee District Library Summer Reading Challenge. For more information, call 810-230-9613. "In the News" is a new Flintside feature that highlights a collection noteworthy happenings in and around Flint. To submit an item for possible inclusion, email flintside@flintside.com.